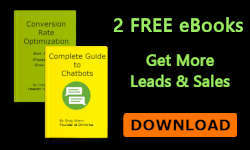 A chatbot is a computer program that can learn over time how to best interact with your website visitors. It can answer questions and trouble shoot customer problems, evaluate and qualify prospects, generate sales leads and increase sales on an ecommerce site. Think of the chatbot as a store greeter or sales person that asks you if you need any help when you enter a brick and mortar store. 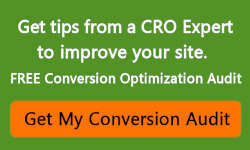 Now your users can ask a question and get an answer instead of searching and reading static pages on your website. The information is still on your site, but access to the right page for the user’s needs is increased significantly, which improves the overall user experience and lead quality. In time, all websites will have chatbots and customers will learn and engage with companies via social networks or an artificial intelligent system with a voice or vision interface. The idea of a list of static pages organized by a navigation bar will be considered archaic. 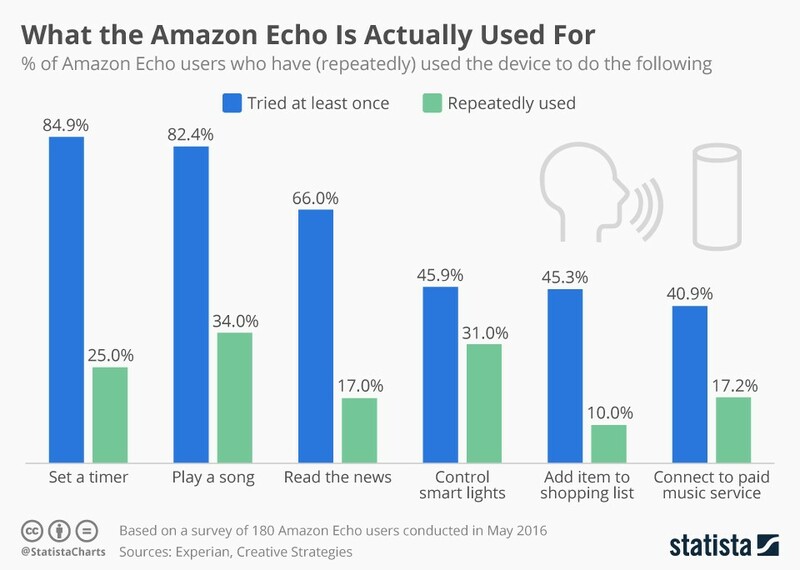 We can already see this shift with the use of Amazon Alexa, Google Home and Facebook Messenger for search queries. 37% of Americans would be willing to make a purchase through a chatbot. 38% of consumers view chatbots positively, 11% negatively, 51% neutral. 49% of consumers prefer to interact via chat, text or messaging. There are chatbots that can have personality-based conversations. You can ask them personal questions for psychotherapy, companionship, and daily organization to help you schedule your day and remind you of appointments. There are even chatbots that can give you news and ideas for your business and work as personal assistants. Messaging apps are overtaking social media apps in number of monthly active user. There are many social platforms with APIs that interface with your bot. For example, Facebook, Twitter, KIK, and Slack to name a few. 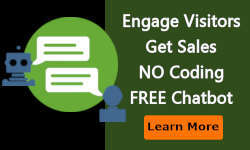 You can engage with users on social platforms or directly on the website. What is interesting about using a chatbot on social platforms is you can make an inquiry just like sending an email. You can ask a question about an event, product or service, or even ask for advice, and the bot sends you an immediate reply. In many ways, chatbot responses are better than email replies because they happen so quickly. We built a few simple chatbots for fun. Just do a search on Facebook or Facebook Messenger for OJokebot, https://www.facebook.com/ojokebot/ some others are OQuoteBot, OZenBot. The most well-known bots are from the big companies such a Google Home (Google Assistant, Allo), Amazon Alexa (Echo, Dot), and Facebook Messenger. These bots are very complex, yet far from being perfect. There are many ways to communicate such as clicking a button, typing text, speaking, and showing an image or video. Chatbots and artificial intelligence are in their infancy and expected to grow considerably in the next 15 years. 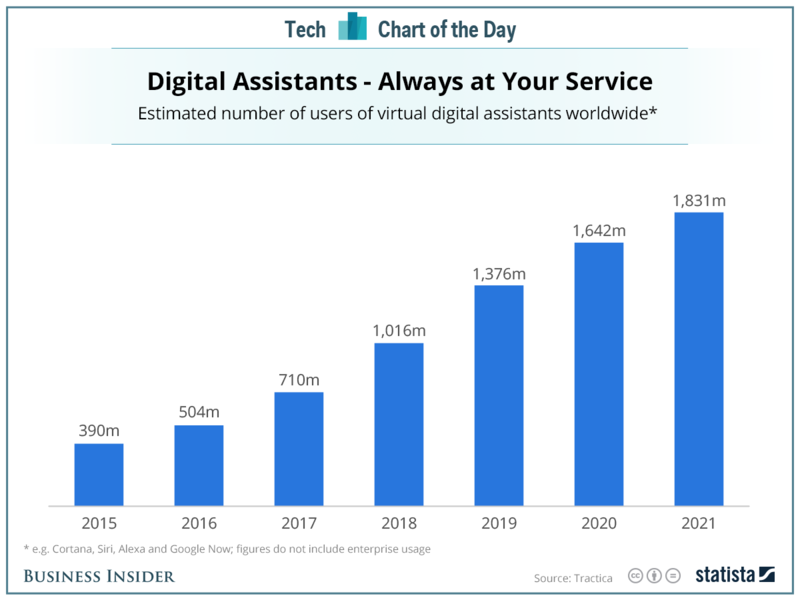 The chart below shows how people are starting to use Amazon Echo and the projected growth of digital assistance. We will be focusing on chatbots used on websites and social networks, but it is important to understand the overall applications of artificial intelligence and machine learning. The core technology is used on websites and social networks. For example, talking to your phone, a website or social network instead of typing text will be the standard. For now, the chatbot technology for websites and social networks is focused on applications such as customer support, lead generation and sales. By 2020, customers will manage 85% of their relationship with the enterprise without interacting with a human, at least for the initial engagement.